You want to tame your long, curly hair for an important meeting, a formal event, or a special night out. How do you do that, and still keep it stylish? Well, the right kind of D-I-Y style is all it takes, with no excessive heat or products! 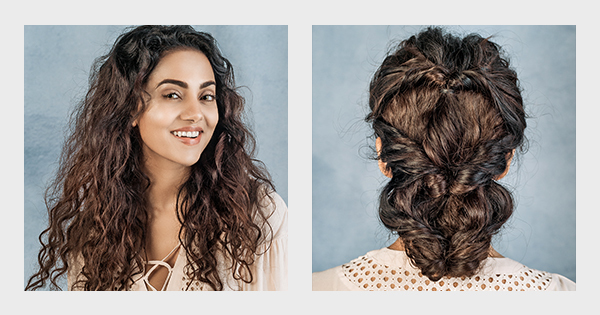 You only need a few bobby pins and hair elastics to style your curly hair. Here is one of the easy hairstyles for long hair that you can do yourself. Step 1: Create a small, half ponytail on the top of your head, and secure it with a hair elastic band. Step 2: Create a gap in your hair above this elastic. Flip the entire ponytail into the gap. Step 3: Pull it out of the gap from underneath. Step 4: Pick up a thick section of curly hair from either side of your temples, and secure it with a hair elastic, including in it, the ponytail from above. Step 6: Tuck in the ends by collecting them into a small bun and pinning them behind the last flip, and you’re long curly hair is in a unique hairstyle! See, we weren’t kidding when we said this was an easy hairstyle. For more easy hairstyles for long hair, here’s what you can do.